On my recent trip to Munich, I had half an hour to myself, so decided to ensure my time was usefully spent. 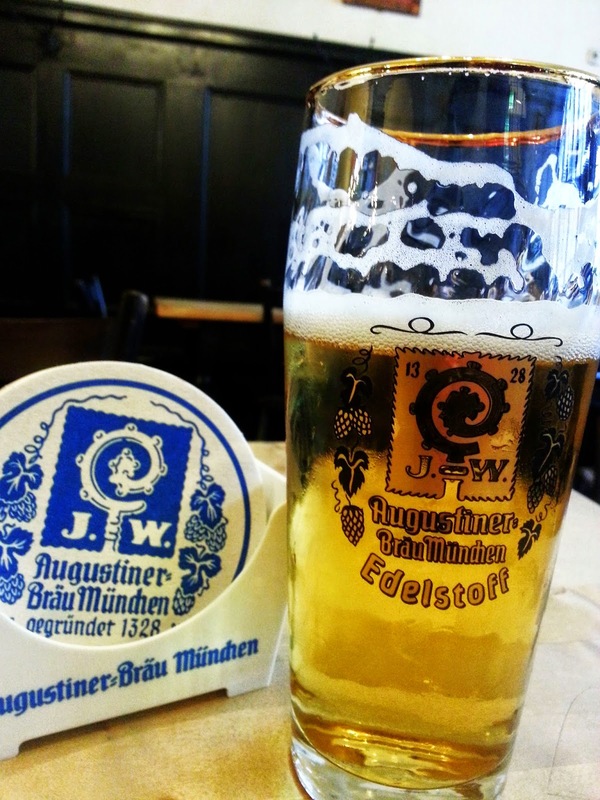 Thus I nipped into the Augustiner Großgaststätte, a massive pub, restaurant and Beer Hall on Neuhauserstrasse and a favourite of mine. It was rather busy, so I ambled around looking for a likely spot. Finding a decent looking perch at the end of an under occupied table, I plonked myself down. Promptly a waitress appeared and told me auf Deutsch "You can't sit there". Having encountered this kind of situation before, I know better than to argue the toss in such circumstances and while having no precise idea why I couldn't sit there, I shuffled off in the general direction of her vague wave. I found a seat on a table not at all dissimilar, with just one guy sitting there and a pleasant male waiter brought me a half litre of Edlestoff and all was well. Almost certainly the waitress was going off shift and didn't want any more customers before she settled up her receipts. Or maybe was just being awkward. That's a possibility too. Funny old place is Germany. There are those that see little merit in Edelstoff. They are quite wrong. It is a super export beer of considerable poise and elegance and far better than the somewhat watery Helles . I also had the distasteful experience of having to crunch a cockroach underfoot in there. I thought at first it was a child's toy. Big bugger but better off dead. I don't think I could have reasoned with it. Not beer prices, but my left shoulder, which has seized up and is showing me what pain is all about. 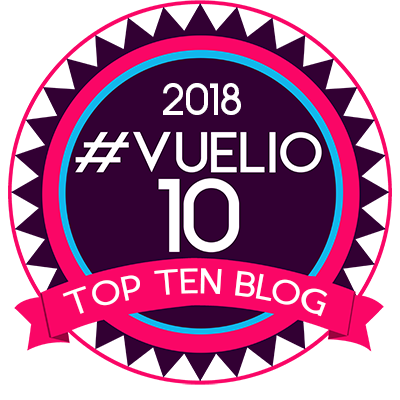 That's why this blog has been silent for too long. It is just too painful to hunch over a screen, hence nothing from me. Physio is kind of helping, but rest is needed. I like the Soup Kitchen in Manchester. Not a pub, more of a genuine café-bar, it has five handpumps though invariably only three or four are on, some craft kegs, a few good bottles, a great atmosphere and service is always friendly and pleasant. You can perch on infeasibly high stools (beware of your legs going numb and the long drop back to terra firma) and watch the world go by both inside and out. OK I might up the average age by far too many years, but it's a firm favourite of mine and as long as you go during the day, there's a chance you won't be the oldest there. On Saturday daytime, after very good pints in Pie and Ale, I visited with a mate. It was my round and three beers were on. We dismissed one on the grounds of not fancying it, one on the grounds of strength (7.4%), so we had the other, a Manchester brewery which is pretty new. 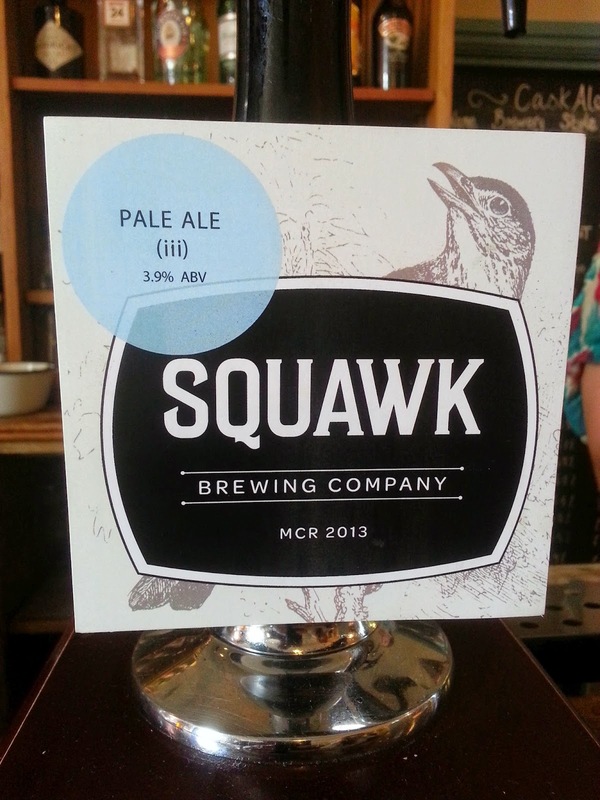 Squawk Pale Ale (3.9%) was purchased after we sampled it. OK, it was a bit warm, but we went for it. I thought I'd misheard the barmaid when she chimed "£8.20 please" but no, that's what it was. I looked at the board. Other beers were around the £3.50 mark. I asked why so and was advised by the barmaid replied that it is very expensive to buy. Hmm. My answer to that would be "Unless it is extra special, don't buy it then." Now I know that beer can vary in price, but I reckon £4.10 for this beer, brewed not more than a couple of miles away, is taking the proverbial. It even exceeds most beers in the Port St Beer House and they know how to charge. But who is doing it? Not the pub they say, who are (presumably) applying their standard mark up. They blame the brewery and the price of the strong beer we turned down would seem to indicate this might be the case. 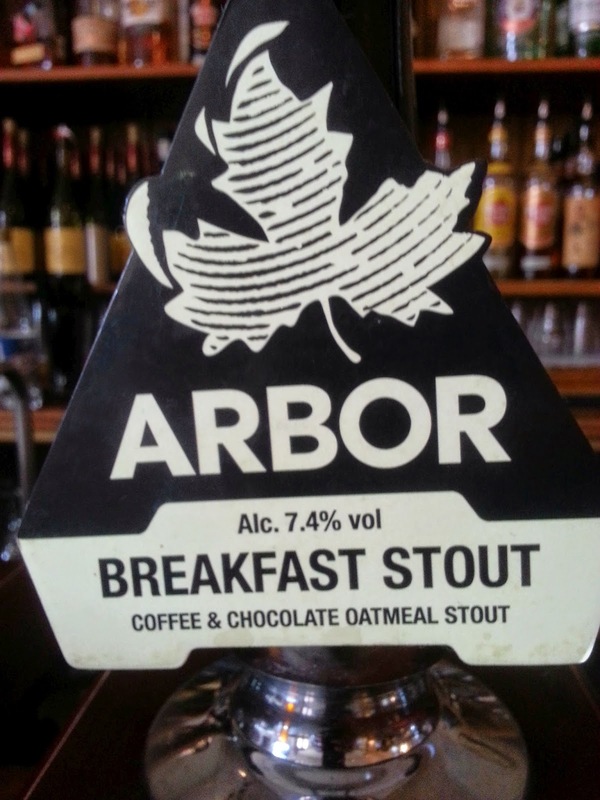 Arbor Breakfast Stout, all the way from Bristol and at 7.4%, a lot stronger, was exactly the same price. (No - they don't charge a standard price for beer.) Nor was the beer, while absolutely fine, anything special to justify the price and certainly not as good as either the Outstanding Green Bullet or the First Chop DOC we'd enjoyed previously. Of course breweries will charge what the market will stand, as will pubs and good luck to them if they can do it, but for me, that was just too much, whoever is to blame. We didn't get a duff pint at all on Saturday and most were absolutely top notch. That at least was positive. Roosters The Italian Job confirms the steady rise back to excellence for this brewery. For those that don't know, Booths are a small, independent, supermarket chain based in Preston with around 29 stores. The nearest to me is Media City in Salford. Think of them as the Waitrose of Lancashire and you won't go far wrong. They are noted among other things for their large and very varied beer selection which has most connoisseurs of bottle British beer, not only nodding their approval, but actively seeking them out. I like them and make a point of popping in when I can, though more usually for their foodstuffs rather than beer. Still, I like beer too and while I don't drink beer at home that much, I was nonetheless grateful to receive three samples from Booths of their latest in house range. Now I tend to leave beer descriptions to those that are adept at it, such as the Beer Nut and those who are not such as.... well, let's move on there, but last night, pre-thunderstorm seemed a good time to give them a try, sat out in the garden in the warmth and sunshine. I also had the lovely E on hand to give here usual forthright views, so what could possibly go wrong? First of all the labelling. Plain, striking and simple. Full marks. Beers descriptions actually told you useful things, rather than "Brewed from the finest malt and hops". More plaudits. 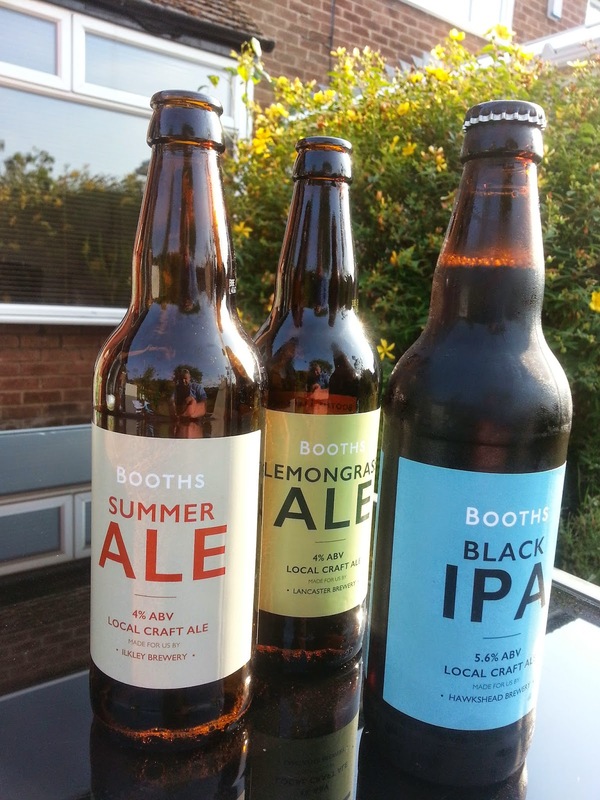 We started off with Booths Summer Ale, brewed for them by the highly respected Ilkley Brewery at 4% abv. The helpful label told us that it contained wheat as well as barley and was bottled by Holdens. 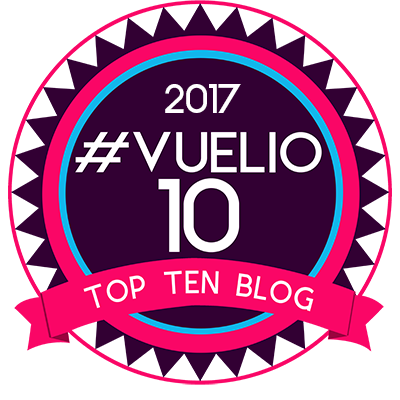 More praise here. This geek didn't know Holdens had a wholesale bottling operation. Well interesting to me, though E seemed less impressed funnily enough. Right away E identified orange notes in the nose. I agreed and the taste of Seville oranges throughout was very pleasing indeed. It claims to be refreshing, though E thought it too bitter to be so. It certainly wasn't a gulper, but to me the Frank Cooper marmalade notes were very attractive. There was maybe just a hint of the promised peach, but neither of us could detect the label's passion fruit. I don't doubt the dreaded crystal malt was there too, as a slight barley sugar note could be detected, but hey, Ilkley clearly know their stuff and it worked. We'd both buy it. Me in a heartbeat. I loved it and could see myself drinking two or three in a row with pleasure. Next up was Booths Lemongrass Ale (also 4%), made by Lancaster Brewery and bottled by Robinson's in Stockport. It promises "natural lemon and lemongrass". There's always a difficulty in this kind of beer which to my mind tend to veer between toilet duck and lemon furniture polish. E didn't like the nose or her first taste, but became a little more enthusiastic as she moved on through her glass. She detected lemon sherbet and thought it rather woody from the lemongrass. My own thoughts were rather sentimentally of the old Huntley and Palmer Lemon Puff in a badly done liquid form. It had lemon and biscuity malt, buy sadly it didn't really work for me at all, though oddly, I liked it more, the more I had of it. E concluded that it was like a "badly made shandy." Funnily both of us would like to try it again, so pick the bones out of that. Last, but by no means least was Black IPA, brewed by Hawkshead Brewery and bottled, oddly, by Agricola in East Yorkshire. I love that. Another new one on me. Now this was almost guaranteed to divide opinion, E not being the biggest lover of dark beers. She loved the piney resinous nose though, but the distinct roastiness wasn't to her taste, but it was right up my street. Now here I have a dilemma. It tasted to me of roast barley, but it could be a modified carafa. I don't know, but even less do I really know what the difference between this and a bitter stout might be. I'd suggest if you changed the label, no bugger would know, or care, or shout foul. Whatever, it was the kind of classy beer that you'd expect from Hawkshead. I liked it and E didn't really. I'd love to see it on cask form at a boozer near me. No real surprises there. To conclude. Three beers, two great and one a bit of a puzzle. Not so bad. Well done Booths. Tasting notes from me eh? Whatever next? My thanks to Booths for the samples. This is by way of an update, so please read the background here and the initial post here first. It all helps my stats and you, Dear Reader, to understand things. Mum and I returned to the newly opened JDW, Captain James Lang in Dumbarton two days after our first trip. Mum had offered to pay, so why not? (She didn't as usual!) This time we were able to sit in one of the much coveted booths and see what was happening at the bar. I didn't give the cask beer a go at first - once bitten -twice shy and all that - but had a couple of pints of St Mungo Lager from West Brewery in Glasgow. Decent stuff, but perhaps they are being a bit fanciful to call it a cross between a Bavarian Helles and a North German Pilsner. At least in my view, though I must try that as an experiment if I ever have the chance to cross pollinate the two. Still, though as I said, it is good stuff. I didn't see any cask being sold for a good while and then a guy asked for a pint of London Pride. It looked clear and he supped it with obvious enjoyment, returning not many minutes later for another. One or two more handpumps were now moving. Things cask wise were clearly looking up. I was deciding whether to plunge in, when I noticed a very tall guy at the bar, with shorts, a fleece top, a notebook and a mullet haircut. Bugger me if it wasn't Timbo himself. 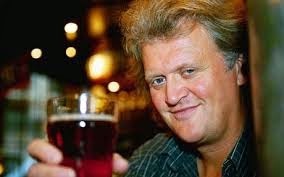 Tim Martin the boss man no less. I went over and said "Tim Martin?" "The same" quoth he amiably. We had a brief chat where I filled him in on the lack of cask beer in Dumbarton over the years and he asked me what I thought of the place. He was very pleasant and told me he'd been doing the rounds of some of his Scottish pubs and waved his bulging notebook at me "These are my observations" he boomed. As I ordered my pint of St Mungo he added "I'll get that". Splendid. What a guy. As I pointed him out to my Mum, he went off on an inspection. I finished my pint and ordered a London Pride. It was rather good as Pride goes. There is hope as I suggested already and the staff were still trying hard. I was very impressed that Tim was, sans entourage, going round his own pubs under what seemed to be his own steam. Can't see many Chairmen doing that. The photo is nicked from the web. 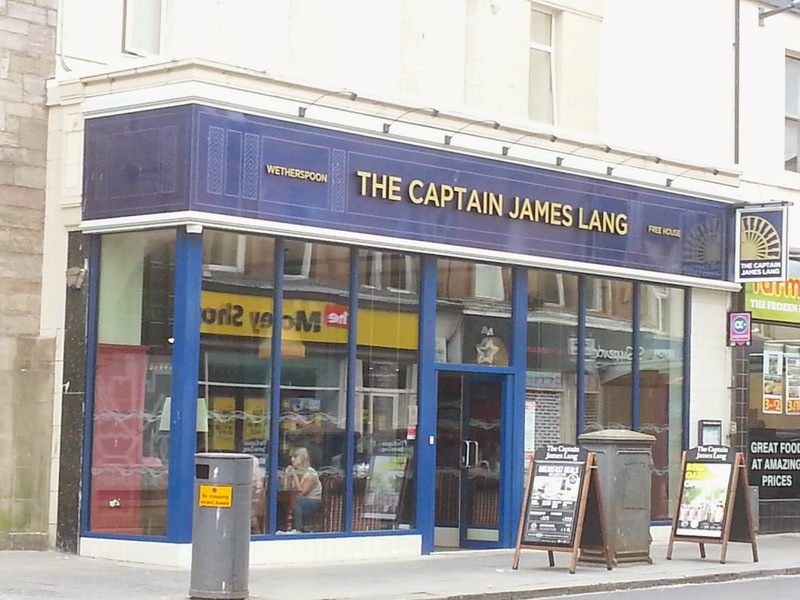 The long awaited JDW, The Captain James Lang, in Dumbarton has opened and a a fine place it is too. The former Woolies has been transformed into a modern and comfortable pub with a long bar and eight handpumps (which is probably the most Dumbarton has ever seen) bringing cask ale back to the town. 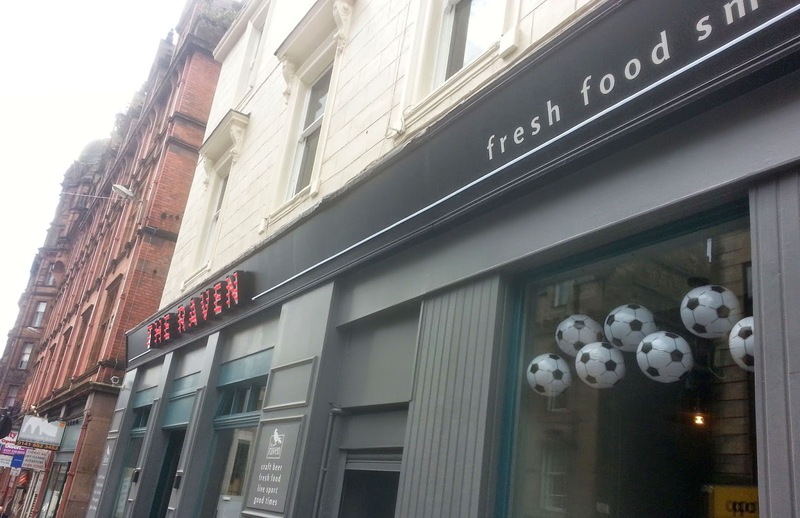 Seating is a mixture of high and low tables, booths (which are popular and commandeered by twos in each case, though they'd fit four comfortably) and a beer garden with spectacular view of Levengrove Park, the River Leven and Dumbarton Rock. It provides food up until eleven at night which brings the number of such pubs in Dumbarton doing so, up to.... err.... one. On a Monday night when I rolled up with my old Mum, it was doing a roaring trade. Now Dumbarton and cask ale are complete strangers to each other. I ordered a pint of something from a Scottish Brewery (I can't remember which) and asked thr barman how the cask was doing. "Flying out" quoth he. My pint was disturbingly murky. Not London Murky perhaps, but too murky for my liking. It was also stale tasting and exchanged with a smile and apology for another pint of murk from a different handpump. Hmm. Third time lucky? Doom Bar it was. Clear looking, so a result? Not quite. It was sour and acetic. I ordered a gin and tonic and went back to my Mum, whose red wine was fine. Meals next. A mixed result. Cremation of meat seems to be the order of the day. My burger was just about OK though hardly succulent. Mum's gammon steak had great potential. Potential as an offensive weapon, or as a stone age axe head. This was exchanged with apologies and later, unexpectedly, by a refund. I took the opportunity to have a chat with the charming and helpful Duty Manager who put it all down to teething problems. I don't doubt it, but it didn't make for a great experience. It will be all right here though. Staff were absolutely fantastic. Cheerful, helpful, doing their best and showing signs of being a good team. Mum enjoyed it too, though I think it was more the red wine, the presence of her son and reminiscences of Woolworths. Don't worry Dumbarton. It will soon be sorted out, but please drink the cask before it goes off. I didn't notice until my way out, as it is tucked away to one side, but a bonus is West Brewery St Mungo on sale. That'll be my tipple until the cask situation is sorted out and not a bad choice in any event. I was alerted by @robsterowski through his blog that a new craft beer bar had opened in Glasgow and as I would be there, soon, I popped in when I arrived on Monday just gone. Handy for Glasgow Central Station, on Regent St, the Raven is operated by former brewer and now pub operator Maclay and is in the ex premises of a pub I believe to have been called the Bay Horse. Maybe.